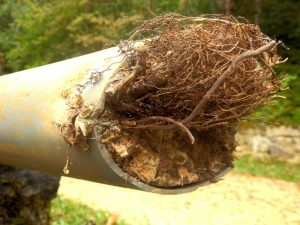 Why Are Sewer Line Issues a Big Deal? The problems that develop in sewer lines are typically the exact same that happen in other kinds of plumbing pipes: clogs and leaks. Of course, location is what makes all the difference. A leak underneath your sink can easily be wrapped up with a towel as you wait for a plumber to arrive, but a leak that forms in a sewer line is twice the trouble: not only is it unsanitary, but you won’t be able to reach it. Before trenchless repair was possible, the only option was to excavate the entire length of the pipe. This requires extra manpower and extra hours, and it can leave a significant scar on your property. It’s as time-consuming as it is expensive. With trenchless repair, there’s no need to dig out the damaged pipe. But don’t let that give you the wrong impression—trenchless repair is far from being a temporary or indirect means of solving the problem. It’s a much more strategic approach. It begins with a video pipe inspection. By feeding a camera into the sewer line, the plumber is able to inspect the entire length of the line through a video feed. Once they find the source of the problem, whether it’s a leak or a clog or something else, they can then measure the distance of pipe to find where, exactly, the problem lies. That way, they can return to the surface knowing precisely where the damaged section of line is without any guesswork. Now, the actual trenchless repair work can begin. First, two small holes are dug out on either side of the line. They can then use the appropriate methods. For example, a leak can be fixed by running an inflatable seal—known as a pipe liner—through the pipe. The liner will then be inflated in order to turn it into a seamless piece of the sewer line. Or, if the sewer line has collapsed or needs replacement, they might opt for pipe bursting the entire line. A pipe bursting tool is fed into the old sewer line, causing it to break outwards. The pipe bursting tool is followed by a new line of pipe which immediately takes the place of the old pipe. Since trenchless sewer repair in Santa Barbara is no small or easy task, you’ll have to rely on an expert to have it performed for you. But given just how expensive and time-consuming the alternatives can be, you’ll be glad you called an expert. To learn more about trenchless sewer repair, contact Husted Plumbing today.